So excited!!!! On our way to see our daughter Katy in Minneapolis. We are taking our camper with us and taking our time, stopping at several places along the way. 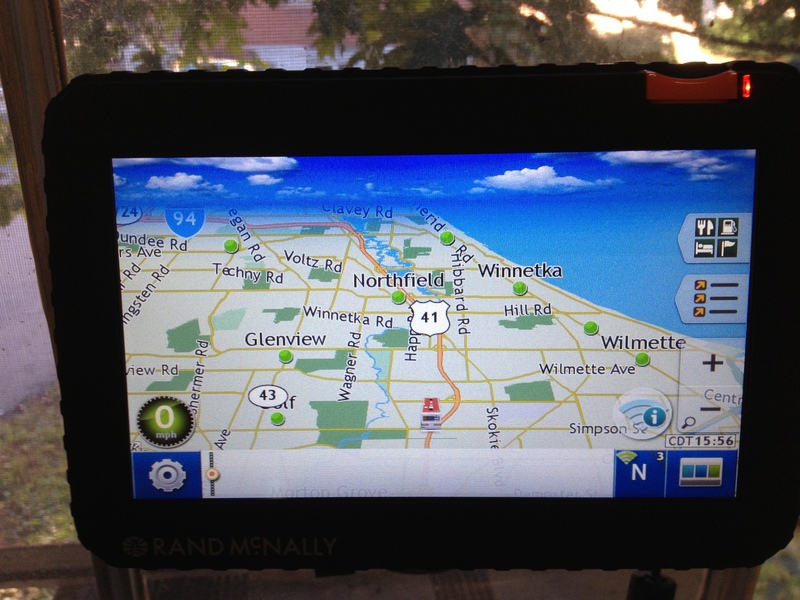 Lee bought an Rand McNally RV GPS based on feedback from the seminar at the RV show and it is really great. Huge screen, and terrific information including fuel prices, weather patterns, upcoming campgrounds etc along our route. The only downside is it occasionally freezes up, but overall wish we would have had one of these a long time ago. MUCH less stress for the navigator and best of all you tell it the height of your trailer and it makes sure to route you away from any low clearance areas. They are pricey but it came with a lifetime of map updates. We also bought a large paper Rand McNally Road Atlas. Way better than a cell phone for a high level overview of your trip. Starting to feel like Rabbit in Twister… “Rabbit is good, rabbit is wise.” :). As we were driving on the NY turnpike we stopped at rest stop and I noticed a tire pressure station designed for trucks and RV usage. I have been concerned about tire pressure on the trailer for some time but it was never convenient to get it checked. Plus, Lee paid for an RV inspection and there were no issues or so we thought. The tire pressure was 40 PSI and it was supposed to be 65 PSI … YIKES!’ We spent the $2 (it took two go rounds to fill the tires) and according to Lee it is a much smoother drive. Plus we saw an immediate uptick in MPH from 7.2 to 7.6. One thing I would like to mention here is yes Lee is responsible for the more mechanical aspects of camping, but we are in this together. He’s human and could use a second set of eyes and opinions just as I can. After 25 years of marriage, I am wise enough to know it may be momentarily satisfying when your partner makes a mistake, but it’s lousy friendship and in the end you both suffer so why put yourselves through it. Things were going great…Lee said driving was much easier with the higher tire pressure. We started having the “Where do you want to eat lunch?” conversation when I remembered we can pull over anywhere and eat :). We pulled into one of the turnpike service stations (needed gas anyways) and went into the camper and had lunch. Sandwiches and chips hit the spot and we were back on the road with minimal wallet impact!!!! After many hours of driving we finally made it to the Niagara Falls KOA. The trip cost $250 in gas, but we made good time. It was raining pretty good when we arrived (glad to have inside jobs during the setup process) and since it’s just one night the setup time was pretty minimal. We went with just two chairs and a small table outside… No rug or carpet or anything. Inside I took a moment to reorganize the cupboards…really can ‘t wait to get a 5 th wheel for more cabinet space. Made a fire and cooked some hot dogs …leftovers for lunch tomorrow 🙂 I made some crunchy slaw substituting walnuts for peanuts since Ralph the chipmunk ate all of ours a couple of weekends ago. Gotta restock. Oh and speaking of that we bought a magnetic notepad and put it on the fridge so when we realize we are out of something we can make a note right then and there. Works great …except Lee forgot to write down the peanuts in all the chipmunk excitement. Don’t make assumptions about your tire pressure. Check frequently. This entry was posted in Uncategorized and tagged newbie campers, Rand McNally RVLM GPS; Rand McNally road atlas; RV tire pressure; RV roadtrip; Niagra Falls KOA. Bookmark the permalink.